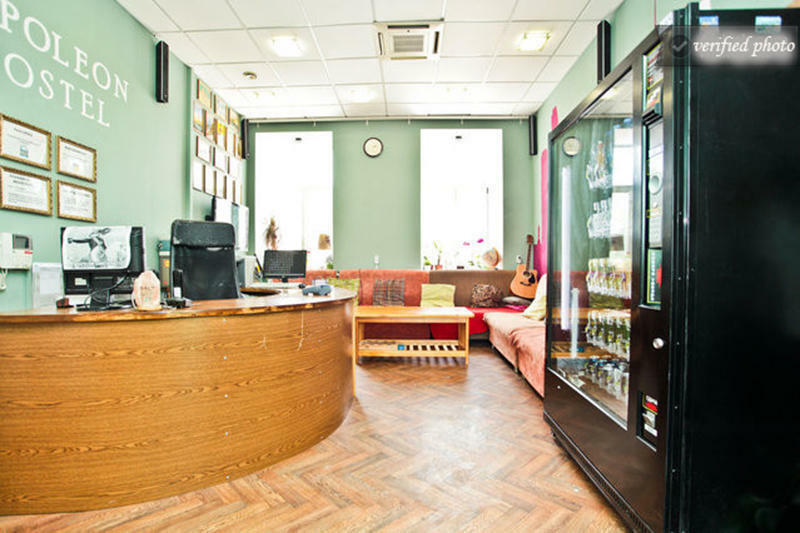 NAPOLEON Hostel is MOSCOW'S MOST POPULAR BACKPACKER HOSTEL and is located JUST 5 MINUTES WALK from Red Square in the trendy old town 'Kitai Gorod' area. This district is characterised with cobbled streets, old merchant houses and quaint Orthodox churches and is full of exciting bars, cheap restaurants, and local supermarkets, all within walking distance. NAPOLEON Hostel is award winning and is recommended in several guidebooks. We pride ourselves on the high level of customer service we provide, our western managed reception is open 24 hours a day (and staffed 24hours a day) and all receptionists speak fluent English and Russian. Our dormitory rooms are clean and spacious, and we have a large lounge decorated with old soviet posters where you can chill out, chat with other guests or get a Russian beer or soft drink. WE ARE THE ONLY HOSTEL IN MOSCOW WITH A BAR !! In addition to providing beds, we can help you with just about everything; visa invitation, visa registration (800R), laundry, tours, taxi, train and ticket booking. WE HAVE LOTS OF FREE STUFF!! **FREE to use towels, iron, hairdryer. **FREE to use guide books, board games, dvds. **FREE local phone calls (Moscow landlines). We don't guarantee you the best time in Moscow, but we will certainly try! NAPOLEON Hostel. The FUN hostel. DOOR ENTRY CODE - press 26 for video phone. TAXIS - We can arrange taxis - please email us. We are located at the Metro Station KITAI GOROD (КИТАИ-ГОРОД), on the Orange and Purple line. Take the 'MAROSEYKA' (МАРОСЕЙКА) street exit. At the metro station Kitai Gorod platform between the trains, look for the sign that says 'Maroseyka'' (МАРОСЕЙКА). The sign is in the middle of the platform hanging from the ceiling and is quite small. Follow this sign firstly exiting the platform by taking the STAIRS, and then the escalator. At the top of the escalators walk through the glass doors and turn RIGHT, here you will enter into an underground passage with many different small shops. Walk all the way to the end of the passage and take the stairs to your left. Now you will be above ground. Walk forward from the stairs 100 meters up Maroseyka Street on the left hand side. Walk past the Old Orange Orthodox Church and take the first left street where you see a perfume shop with a huge plasma tv on it, this street is called Bolshoi Zlatoustinskiy Street. Walk down this street for 20 meters, then take the right turning called Maly Zlatoustinskiy Street. There should be a busy Russian restaurant here called Pirogi. Walk for 60 meters down this street and you will see our sign outside Dom 2 (House 2.) Enter the stairs and we are on the 4th Floor. The total walk from the metro is 2 minutes. AIRPORT DIRECTIONS. For all AIRPORTS (SHEREMETYEVO, DOMODEDOVO, Or VNUUKOVO). Take the airport express train (cost 300-350 Rubles, 35-45 minutes, trains depart every 30-60 mins 6am-middnight) to central Moscow. All stations connect to the metro and take the metro to Kitai Gorod. In all cases take the metro to KITAI GOROD metro station and follow the instructions above.